Counting in Greek “1, 2, 3”, like a clock, Virginia Mastrogiannaki attempts to mimic an analogue machine - a tool for calculating time. At ANNAELLEGALLERY, Virginia, the human clock, will keep time without pause during the gallery’s opening hours over the course of four days. The performance, Jargon, runs from the 23rd to the 26th of February 2017. The performance, originally commissioned by NEON and MAI (Marina Abramovic Institute) for As One (Benaki Museum, Athens, March 10-April 24, 2016), challenges Virginia to remain focused on every minute measuring time as it passes, testing the limits of body and mind. However, because mistakes are unavoidable, throughout the performance, she scribbles down numbers on material in order to keep the mind focused. Virginia Mastrogiannaki graduated with a Masters degree from the Athens School of Fine Arts of Athens (2013), a Masters degree from the School of Visual and Applied Arts—Faculty of Fine Arts, AUTh (2010), and received the D.N.S.E.P. (International Superior Degree of Plastic Expression) from the Rouen School of Fine Arts, France (2002). She has recently exhibited at The Right To Be Human, curated by Thalia Vrachopoulos & Harry Savopoulos, Thessaloniki Center of Contemporary Art in 2017; in 2016 jargon, long durational performance (7 weeks- 324 hours) As One, curated by Paula Garcia & Serge LeBorgne, NEON+MAI (Marina Abramovic Institute), Benaki museum, Athens and like me, Post Greek. 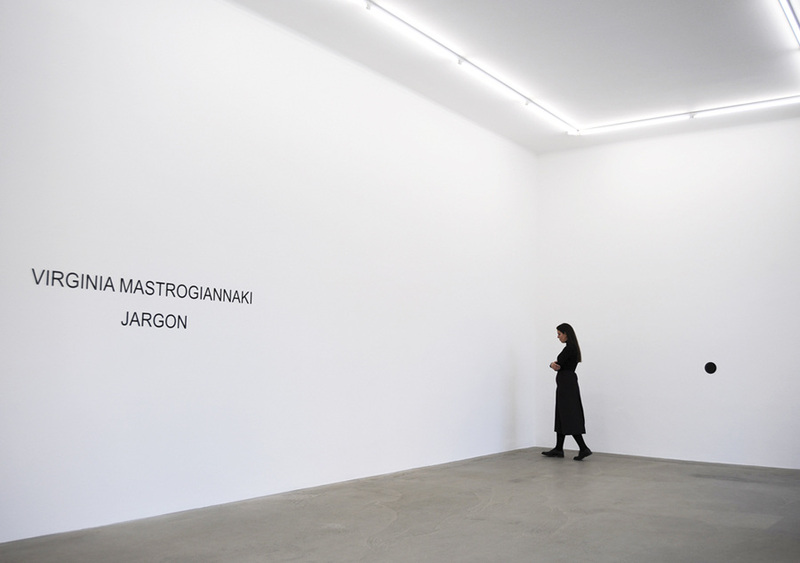 Aristotelouss project / Kalfayan Galleries, curated by Areti Leopoulou, Thessaloniki, and aux aguets, curated by Jason Karaindros, La Petite Fabrique d'Art, Paris, France, and holy book, Typography as an act of art, curated by Maria Tsantsanoglou & Syrago Tsiara, Contemporary Art Center of Thessaloniki; in 2015 Global Control and Censorshipcurated by Bernhard Serexhe at ZKM in Karslruhe, Germany, and the 5th Young Artists' Workshop Romance curated by Areti Leopoulou and Yeni Tjami at the Thessaloniki Biennale; in 2014, the Municipality of Thessaloniki Pavilion at the 24th International Istanbul Art Fair in Turkey, curated by Nikos Mykoniatis & Thalea Stefanidou, and the Lhi-Lna resident programme in Almopia, Greece; in 2012, Roomscurated by Charis Savvopoulos at the Saint George Lycabettus in Athens, Greece; in 2009, Kitsch Today at the Museum of Contemporary Art of Thessaloniki in Greece; in 2004, resident sculpture workshop Imbahim Calli in Pammukale, Turkey; and in 2002, Paris-Berlin/Recontres Internationales at the Immanence Gallery in Paris, and Podewill Contemporary. 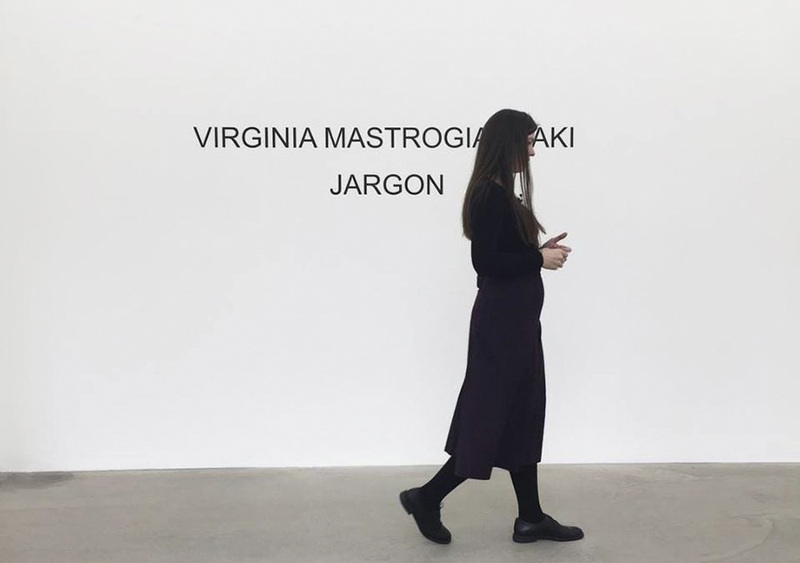 Jargon skapades för utställningen As One på Benakimuseet, Aten 2016 i samarbete med NEON och MAI (Marina Abramovic Institute). Efterliknande en analogisk maskin räknar Virginia Mastrogiannaki "1, 2, 3..." på grekiska utan uppehåll som en mänsklig klocka under galleriets öppettider i fyra dagar. Under Virginia Mastrogiannakis performance utmanar hon sig själv både fysiskt och psykiskt att hålla fokus varje minut för att testa sina gränser och för att undvika att begå misstag antecknas klockslag för att behålla fokus. Virginia Mastrogiannaki har en magisterexamen från Athens School of Fine Arts of Athens (2013), en magisterexamen från School of Visual and Applied Arts-Faculty of Fine Arts, AUTh (2010), och fick D.N.S.E.P. (International Superior Degree of Plastic Expression) från Rouen School of Fine Arts, Frankrike (2002). Nyligen har hon visat följande: 2017 The Right To Be Human, kurerad av Thalia Vrachopoulos & Harry Savopoulos, Thessaloniki Center of Contemporary Art; 2016 jargon, long durational performance (7 weeks- 324 hours) As One, kurerad av Paula Garcia & Serge LeBorgne, NEON+MAI (Marina Abramovic Institute), Benaki museum, Athens och like me, Post Greek. Aristotelouss project / Kalfayan Galleries, kurerad av Areti Leopoulou, Thessaloniki, och aux aguets, kurerad av Jason Karaindros, La Petite Fabrique d'Art, Paris, France, och holy book, Typography as an act of art, kurerad av Maria Tsantsanoglou & Syrago Tsiara, Contemporary Art Center of Thessaloniki; 2015 Global Control and Censorship kurerad av Bernhard Serexhe at ZKM in Karslruhe, Germany, och the 5th Young Artists' Workshop Romance kurerad av Areti Leopoulou och Yeni Tjami på Thessaloniki Biennale; 2014 the Municipality of Thessaloniki Pavilion at the 24th International Istanbul Art Fair in Turkey, kurerad av Nikos Mykoniatis & Thalea Stefanidou, och the Lhi-Lna resident programme in Almopia, Greece; 2012, Rooms kurerad av Charis Savvopoulos at the Saint George Lycabettus in Athens, Greece; 2009, Kitsch Today at the Museum of Contemporary Art of Thessaloniki in Greece; 2004, resident sculpture workshop Imbahim Calli in Pammukale, Turkey; och 2002, Paris-Berlin/Recontres Internationales at the Immanence Gallery in Paris, och Podewill Contemporary.